What is your Depth Gauge telling you? Although we are in 94.4ft of water, our chart shows we should be prepared to enter less than 20 feet in a short distance. You bought a boat and are ready to go fishing. Maybe you just want to cruise around the harbor. You have an entire suite of electronics to help you. 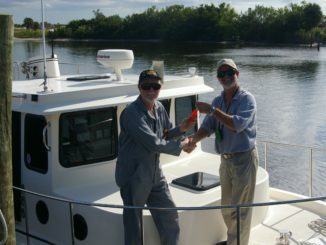 So you finally spot the one that reads depth gauge (or SONAR or Fish Finder). What does that really mean? 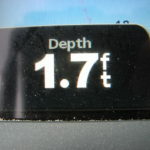 What your Depth Gauge is telling you. 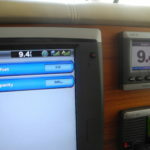 Depth sounders can measure how much water there is under your boat. But maybe it measures from your transducer, waterline or even under the keel or propeller. There is a reason for so many options so let’s get to it. Most late model depth gauge units have an offset feature. This offset allows you to adjust what the dashboard indicator shows you. From the transducer- This value offers exactly the distance from the hockey puck-like projection on the hull to the water bottom. In my opinion, this number requires too much math. I want to know if there is enough water…or not. 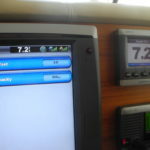 From the boat’s waterline- Some people like this feature because they compare that readout to the chart. BUT the chart only shows low tide depths. So comparing this readout may only be useful at low tide – without a full moon or wind. There are critical times you need to trust your depth gauge. And then there’s that pesky math again. 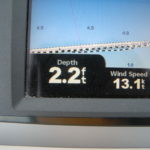 From the keel- You can adjust the readout to display the distance from the deepest part of your boat. 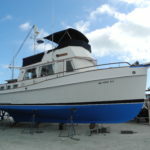 The deepest part is often the keel, depending on the type of boat you have. This way you always know how close you are to hitting bottom. 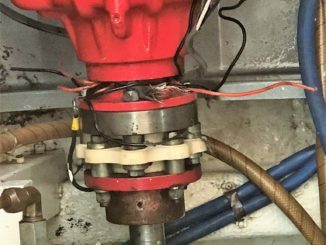 From the props- If your propeller or POD unit is lower than your keel you may want to adjust the unit readout to reflect this. Your choice! Just decide what you want the offset to be and understand what the display is telling you. Don’t forget to click on the photo gallery below. Each photo with captions will help you understand the transducer location and how your offset effects your display. Seeing is believing! 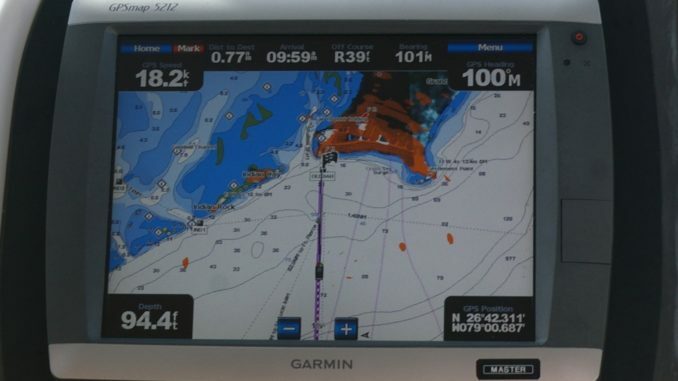 Learn what your electronics are really telling you so you can be a more confident boater. Knowing your depth is essential when anchoring too. 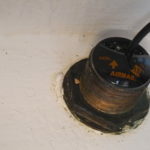 Before you can safely set the proper scope for your anchor rode you must know the correct water depth. Join us for Cruising 101 FUNdamentals and learn what to know before you go! 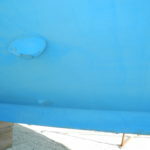 The depth transducer is under the hull, about 2 feet above the props and 2 feet below waterline, just to the right of the tripod stand. 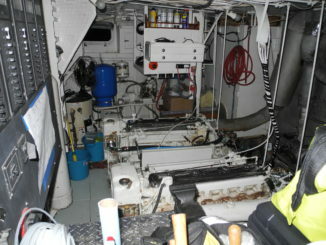 Depth transducer inside the hull. Depth transducer with water flow profile wedge. Getting shallow. Are we aground yet? This +2 offset will show depth beneath the vessel keel. This -2 will show waterline depth. This ZERO offset will show depth from sending unit. Water depth or….? What is your depth gauge really telling you?